The Ho'oulu Community Farmers Market at the Keauhou Beach Resort/Outrigger Hotel in Kahalu'u, Kona. 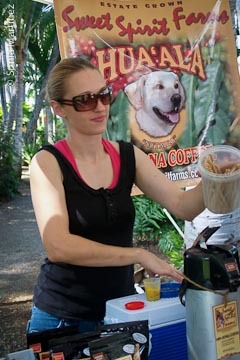 The Ho’oulu Community Farmers Market, located on the grounds of the Keauhou Beach Resort/Outrigger Hotel, is a laid-back mid-week market. Opened only since last October on the hotel’s luau garden site, the Wednesday market hours are from 10 am to 3 pm. This market is sponsored by Na Wai Iwi Ola, a non-profit foundation that perpetuates Hawaiian customs and history, and by the Keauhou Beach Resort/Outrigger Hospitality Program. It focuses on vendors who sell only locally grown produce and fruits, coffee, macnuts, honey, eggs, preserves and other value-added products, as well as local artisan crafts. When asked, market manager Greg Smith replied that at least 50% of their products are certified organic, if not more. Although eggs are available from time to time, he would like to see a vendor selling eggs and one who sells corn on a consistent basis. Music is provided by Ron Exzabe and the market plans more entertainment as it grows. There is a shuttle bus service that drops off and picks up people at the hotel on a regular basis and while there I noticed several people get off the gaily decorated bus and go straight to the market area. When I asked one of them if they were residents of the area, the response was they were staying at a time-share condo a couple of miles away and found shopping the Ho’oulu market a bonus! Greg Smith of Earth Matters with colleague Collee Nevins of Just MacNuts. 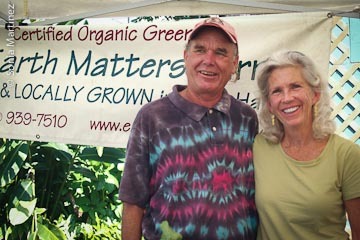 Greg and Gail Smith of Earth Matters have been a part of this market since the beginning almost 5 months ago and Greg is also serving as market manager. Although the Smiths have been farming for about 20 years, previously in Baja, Mexico, their Ocean View farm is only 3 years old. Located at the 2,200 elevation, it is an organic and sustainable farm where the Smiths make their own soil and grow head lettuce, green beans, mixed baby greens, arugula, baby romaine, cilantro, spinach, basil and other herbs, edible flowers and quite a bit of other seasonal produce. Earth Matters will be starting a prepaid subscription-only weekly CSA service. If interested, check their website at www.earthmatterstravel.com to get more information on how to contact them and subscribe. Colleen Nevins of Just Mac Nuts shared space with Earth Matters selling her macadamia nut products. On the day we were there she was giving sample tastes of her macnut butter. Ernie "Pancipanci" Torres's koa kitchen tools. 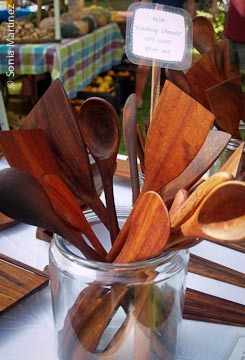 Ernie “Pancipanci” Torres, owner of Panci of the Pacific was displaying his handmade koa kitchen utensils and other beautifully made craft items. He explains that his partner in this venture is his wife Karen Rae. Ernie has been creating with wood since he was 9 years old. A natural free form artist he has always worked for himself. Ernie works only with native woods, mostly koa, at his Old Kai Malina Ranch located in Kailua-Kona. His respect for the natural world around him leads him to work only with fallen wood or standing dead trees. His creations include free form boxes, benches, tables, barstools, shelving, hooks and other custom requested items. What attracted me to his booth were the beautiful long-handled kitchen utensils, single and double sushi trays, plates, platters and chopsticks. Ernie told me that the utensils, made both for left-handed and right-handed users were his best selling items. The sushi trays and chopsticks, which are made in 3 different sizes, are also very popular. Erin Sims of Sweet Spirit Farms. 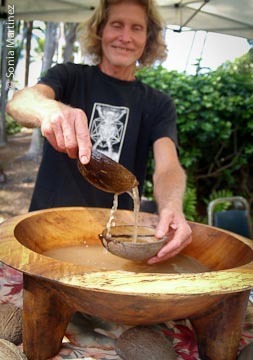 Randyl from The Sanctuary of Mana Ke'a serves kava. Randyl Rupar of the Sanctuary of Mana Ke’a Gardens, has been farming and in business for 10 years and participating in this market since the beginning. His organic and sustainable farm is located at the 1,700 elevation in the Honaunau area and produces avocadoes, coffee, cherimoyas, citrus, bananas, ‘olena (Curcuma domestica or turmeric), medicinal herbs and ‘awa (kava). The Sanctuary also makes distillations of essential oils and hydrosols. Randyl’s best selling products are the essential oils, Hawaiian hydrosols, fruit and coffee. On the day of our visit we noticed several people consuming shells of ‘awa as well as smoothies made on the premises with fresh fruit from the farm. Cost per stall/booth: $25 yearly membership and a $20 weekly fee. a. Range of products: Veggies, fruits, herbs, dairy, poultry/eggs, seafood, processed/value-added. No meat. b. Best selling products: Produce, Coffee, Eggs, Bread, Mac nuts, Jams, Jewelry, prepared food! Special Features: Music is provided by Ron Exzabe and the market plans more entertainment as it grows.